Whatever your main “why” for starting an Amazon business—whether more time, money, freedom, ownership—we all have dreams of building the business into a huge headline success. It may just be a speck of light on the horizon, but it is there. And it is doable. A few weeks ago, dreams of massive success for e-commerce entrepreneurs everywhere just got a new success story to look up to: Dollar Shave Club. It was announced that Unilever is acquiring the five-year-old startup for $1 Billion dollars. A full “bill”, with a “B”! Wow, I was not keeping tabs on the companies growth, but that is an amazing feat after only 5 years of being in existence. The New York Times did a great piece on the acquisition, which you can (and should) read here. When reading this piece, it amazed me how the Dollar Shave Club business model mirrored the Fulfillment By Amazon business model. The founders, Mark Levine and Michael Dubin, believed that men would want regular shipments of shaving supplies at a cheaper price than what Gillette and other large companies offer. They outsourced the product manufacturing, outsourced the distribution and fulfillment, and focused on marketing, design, and customer service. Sound familiar? Yep, it’s nearly the same approach that FBA Sellers take when launching and scaling their products! In fact, Amazon makes it even easier than the path that the Dollar Shave Club took, because the second that you have an active listing on Amazon, you automatically have millions of potential customers that you can compete for. Selling on Amazon immediately solves two major challenges for e-commerce entrepreneurs: finding customers, and scaling the business. There are three key takeaways from the success of Dollar Shave Club that I think applies to you as an Amazon seller, e-commerce entrepreneur, and digital marketer. Dollar Shave Club blasted onto the scene with a witty and hilarious explainer video. Sure, the video checks off all of the informational basics of what Dollar Shave Club is—a simple subscription for shaving products. But the video said much more, in the style, humor, and direction of the video. I know that a bunch of my friends and family sent the video to me because they knew that I would love it (or maybe it was their subtle hint that they wanted me to shave more 😉 ). I am right in the demographic that Dollar Shave Club is targeting, and their video and overall marketing is spot on. To me, it seems authentic, relatable, and different. It is a brand that I want to associate with. You are probably not selling men’s grooming products, but the takeaway is still relevant: you need to understand your target audience inside-out and communicate in a way that they understand implicitly. 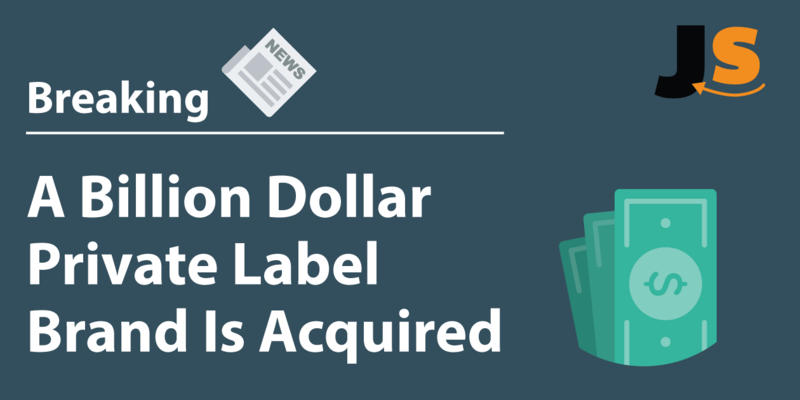 Private Label Products can be a dime a dozen (literally!). There may not be a lot that differentiates your product from alternatives. 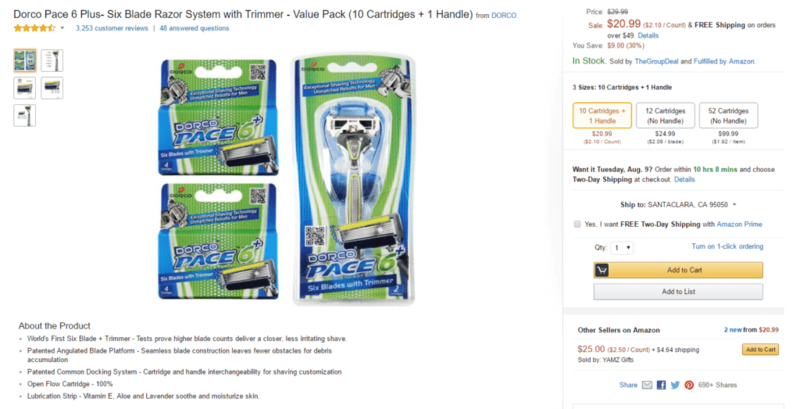 Do you really think that one six-blade razor is that different from another six-blade razor? It isn’t that different, trust me. But the branding, the packaging, the experience, is what is the differentiating factor. Once you have done your thorough product research and you are putting your listing together, really focus on speaking to your customer and think about what would make your product stand out. When I do Amazon product research, the first thing that I look for is demand. This signifies that there is an existing pain point, and people specifically searching for a solution. If you want to read and watch how I found the marshmallow sticks that have sold more than $75k in about 8 months, read more about it here. The Dollar Shave Club guys had their hypothesis that men would want cheaper and easier ways to get shaving products, and they put it out. Entrepreneurs like to call this a “Minimum Viable Product”, or the most simple version of a product that can put in front of customers to validate demand. Creating a Minimum Viable Product (often called an “MVP”) is even easier for Amazon sellers. In fact, you don’t even need to create your own private label brand, but instead can purchase a small batch of product from Aliexpress, and test the market. How quickly does it sell? Will customers pay your asking price? How often are people searching for the keyword that is relevant to your product? All of these questions can be answered as you test your MVP with the market. Amazon is a great proxy for the market at large. After you have proven that demand exists on Amazon, then you scale your brand into new markets, create your own website and e-commerce channels, and onwards. The key is that you use Amazon to validate your customer demand. Once you have done so, you have conquered the largest challenge that startups face, which is finding customer demand. What I love about Dollar Shave Club is its sheer simplicity: an e-commerce subscription business for men’s products. There is nothing extraordinary about it—razors have been in demand for centuries. One of the most counterintuitive things for people who are just starting to sell on Amazon is that they do not need to create a new product. In fact, they should be as uncreative as they can be, and not try to invent a product. How is that for competing against your supplier? I’m not even sure though that a Dollar Shave Club member would even recognize the difference in razor if the supplier changed. Referencing my first two points, Dollar Shave Club has identified their tribe of customers and addressed that customers’ needs. The specific minutiae of the product are almost an afterthought after these two have been established as strongly as they have. I find that this acquisition is an inspiring beacon of what happens when a business plan is executed flawlessly. At some point hopefully Harvard Business School can make a case study about the unique circumstances in distribution and technology that made such a success possible, but I am confident that many of the elements that made Dollar Shave Club a success are also available to all Fulfillment By Amazon sellers. It is a shining example that finding a great product, solving a customer pain point, and presenting the solution to the target market in a unique and relatable voice can lead to unbridled success. To the tune of a billion dollars. I know it is a lofty goal, but it is something that we can achieve. What takeaways do you find most inspiring from this story? Let me know in the comments section below! 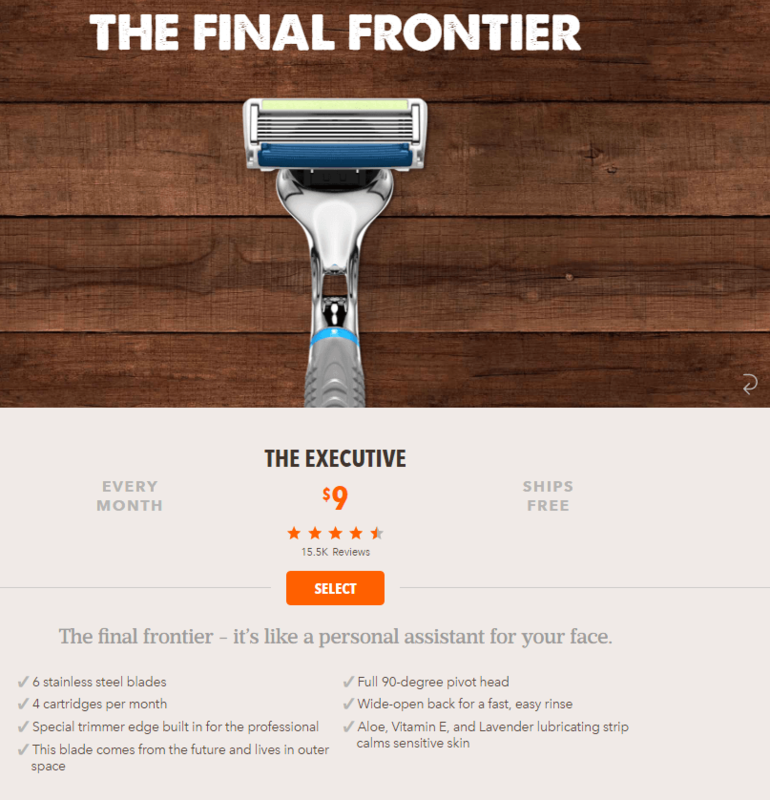 You can find other profitable products just like Dollar Shave Club by using the Chrome Extension. Great article You have put one more piece into my puzzle. Dorco is south korea based company. I am also using Dorco. Very inspiring! Great article. Love the video too. Amazing to see everything fall into place with such an simple, plain product! Awesome, the wheels are spinning Now! Glad I took the time to read! The takeaway that is most inspiring to me is that you can build a company and exit for 1 Billion in 5 years with a simple product like razors! Pretty incredible. Thanks for sharing, Greg.